This badge was issued to Jatturaput Nilumprachart on 27 Mar 2018. 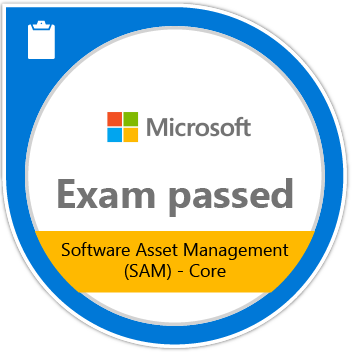 Passing Exam 713: Software Asset Management (SAM) - Core validates the skills and knowledge necessary to execute solutions that are necessary to improve the management of on-premises and cloud software assets. Candidates demonstrate the ability to assess SAM design and manage a SAM program by using the SAM Optimization Model, manage software licenses, coordinate data collection technologies and software asset life cycle.